This twisted silk is equivalent in size to a #5 Perle cotton. A lustrous shimmery thread, Trebizond comes in many pure tints and hues, perfect for shading. A twisted silk perfect for needlepoint and Hardanger. Size is equivalent to a size #5 pearl cotton. 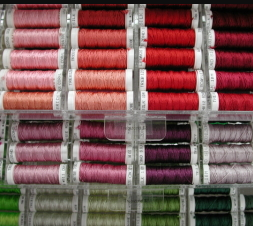 This lustrous shimmery thread comes on a spool of 10 meters. it is a 3 ply twisted filament silk that comes in nearly 190 colors. It is designed to cover 18 mesh canvas doing a tent stitch.